Across the S&P indices, growth stocks continued their year-to-date outperformance versus value stocks in the large-cap and mid-cap tiers. Although third quarter estimates are not as strong as the second quarter, S&P 500 Index constituents are expected to report revenue growth of 5.0% with earnings growth of 4.2%. Despite the lower estimates, a record number of companies issued improving revenue guidance in the third quarter. Fourth quarter projections resume strong double digit earnings being up 11.2% with revenue growth rising 5.7%. For the year, earnings growth is projected to be 9.6% with revenue growth of 5.7%. According to S&P 500 Dow Jones, S&P 500 companies continue to reduce stock repurchases but persist in paying record dividends to shareholders with an aggregate increase in quarterly dividends of $15.5 billion, up 6.9% over last year. Dividend growth rates should steadily rise due to continued earnings expansion, strong cash flow and possibly repatriated offshore earnings. Historically equity market performance is higher during a Fed easing or neutral period compared to a tightening cycle when the market experiences lower average returns. 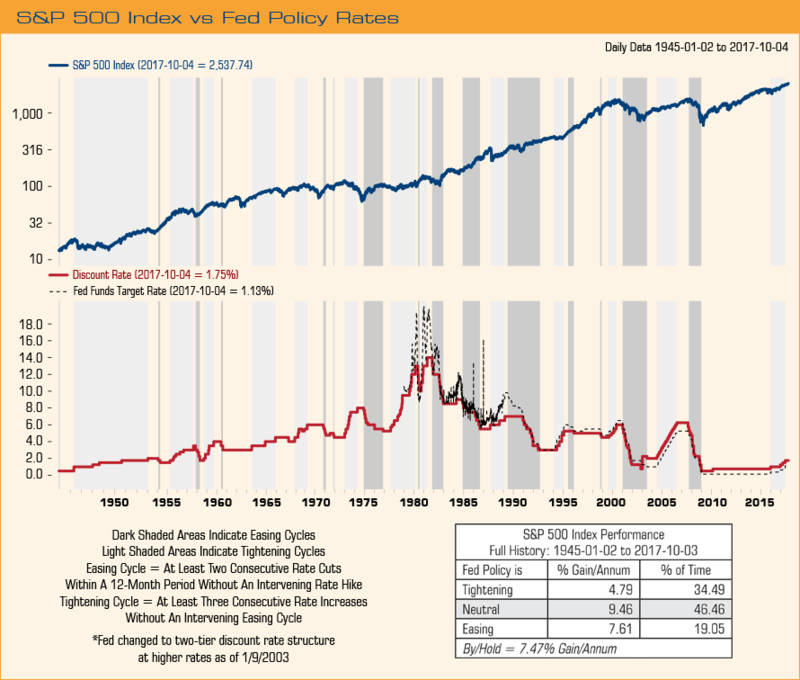 Nonetheless, no two tightening periods are alike and market performance can vary greatly based on the absolute level of interest rates and the frequency of rate hikes over a period of time (see chart S&P Index vs Fed Policy Rates). Eight of eleven S&P 500 Index sectors project year-over-year earnings growth led by Technology, Energy and Real Estate while an earnings decline is expected in Consumer Discretionary, Utilities and Telecom. As rates rise, sub-sectors such as banks, capital markets and insurance should gain momentum along with rate sensitive areas such as machinery, electrical equipment and construction (see Rising Rate Industries chart). 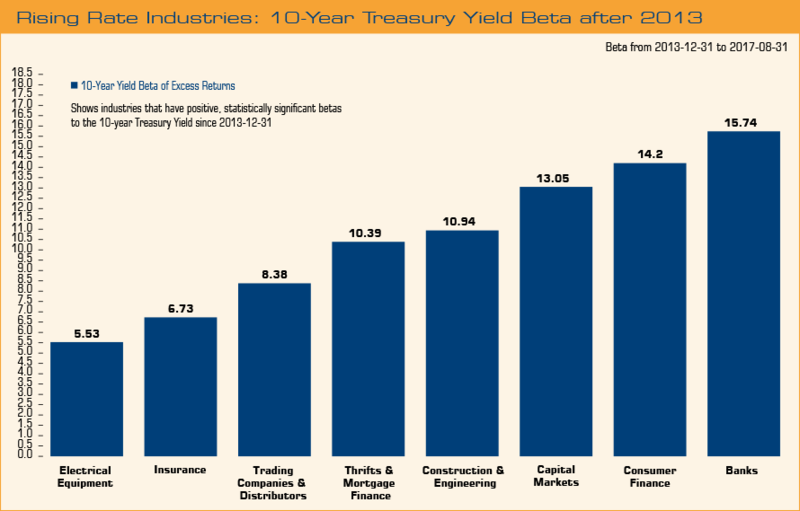 Traditional bond proxy sectors such as Utilities, Consumer Staples and REITs may experience downward pricing pressure from rising rates, although potential tax reform could benefit several sectors paying a higher tax rate. Telecoms, Industrials, Consumer Staples and Financials carry an average tax rate of 30.4% versus Real Estate, Energy, Technology and Health Care sectors which average a lower 15.5% tax bracket. For the quarter, the best performing sectors were Technology rising 8.28%, Energy up 6.0% and Materials increasing 5.5%, while lagging sectors included Consumer Discretionary up 0.4%, Real Estate flat at 0.1% and Consumer Staples down 2.0%. Leading companies included AbbVie up 23.6%, Texas Instruments rising 17.2% and Raytheon increasing 15.5%. Companies experiencing underperformance were Quest ­Diagnostics down 15.4%, British Tobacco lower by 7.7% and Corning increasing a mere 0.1%.